They say the reward for good work is more work. Hopefully I’m doing a good job, because I’ve been swamped. A company sent me a box of knives a couple months ago, and they’ve been really patient, so now I’m trying to power through some of these reviews. This is a review for the Sanrenmu Plus 4077. This is an EDC style pocket knife which features a lanyard point and a carabiner style, spring-loaded gate clip. 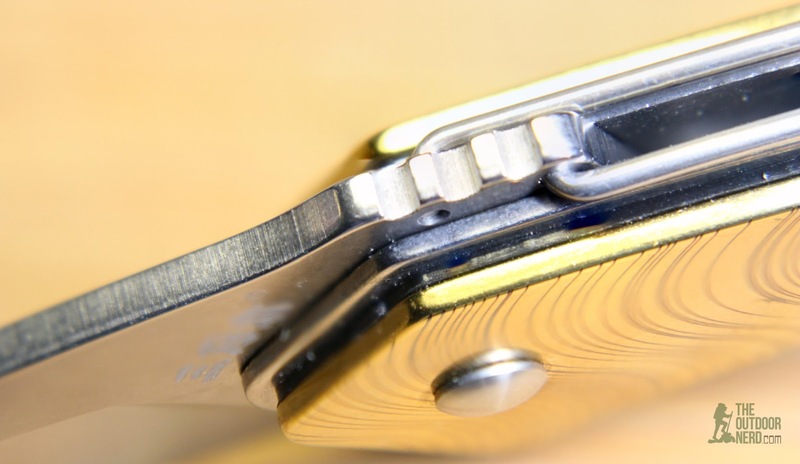 Note that there is no locking mechanism, which could be a plus if you live somewhere like the UK, where it is illegal to carry a locking pocket knife. Presumably it’s made from the same manufacturer, it has the “Plus” designation, comes in completely different packaging than the “Classic” models and it’s a totally different style than most of their classic pieces. So, I dunno. For that reason, I’ve given this review sample some extra scrutiny. Nowhere is it mentioned what steel this knife uses, but we know that it’s Chinese and mostly likely 8Cr13MoV or the slightly harder 440C. This first struck me as a “cutesie” knife, and it’s non-locking, so right off the bat, I know that I’m not going to be carrying this one very often, if at all. But it’s still presumably a Sanrenmu, and the fit and finish is fantastic. This sample gave me some red flags that it’s not a real Sanrenmu, but the closer I look at, the better it looks. Knockoffs of already-cheap knives don’t make that good of an impression on me, so it’s either real, or it doesn’t matter because the quality is there. The build quality on my review sample is good overall. But be aware that there is nothing holding the carabiner style clip in place. The first time I clipped it to a real carabiner to take photos of it, the clip went flying. But it should go without saying not to trust your life to an 8 dollar pocket knife. 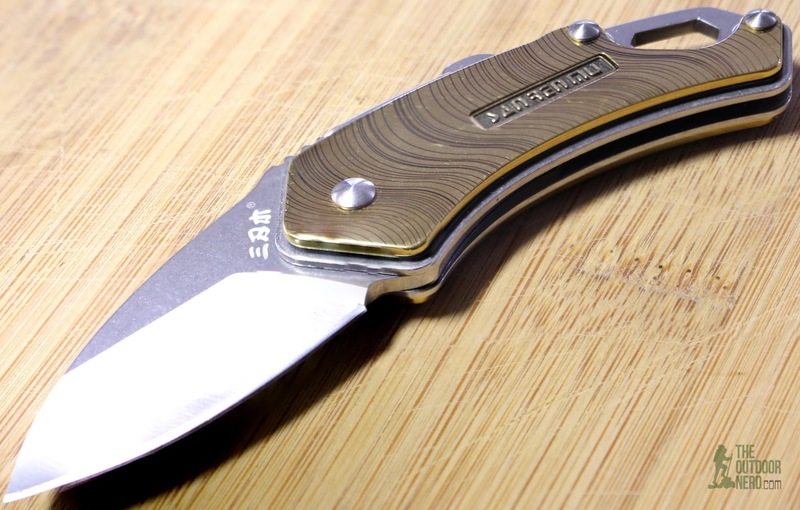 Other than the flimsy clip, the build quality is above average for a pocket knife, even given the price. You could probably convince people this is a 50 dollar knife until the wire clip falls off. Overall, excellent. A couple faint hints of tool marks on the spine of the steel liners, and that’s about all I can find wrong. 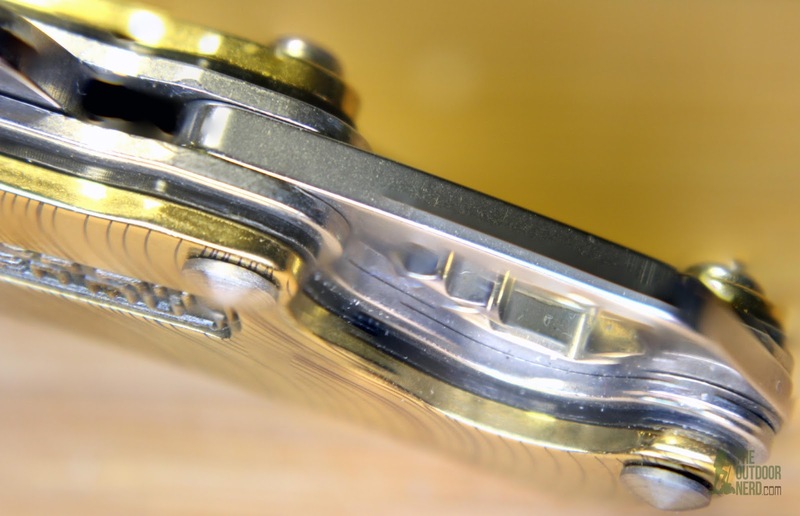 Oh, the screws look cheap–like they will strip the first time you use them. What’s funny is that the awful screws are a clue to me that this is an authentic Sanrenmu. The blade looks to be off center by just a hair, but it could be just me, because there’s only a fraction of a millimeter tolerance on either side of the blade. It almost has to be perfect to open smoothly. The rest of the knife has a fantastic finish. The machining is spot on. This one has brass colored scales. I don’t know if it’s real brass, but they look polished–almost refined. This is a classy looking knife. This knife has an interesting construction. It’s a stainless steel skeleton, with a layer of plastic and a layer of what looks to be brass, forming a sandwich with the plastic liner. I can’t see the plastic with just my eyeballs, and didn’t notice it until I saw it on the photos. It looks fantastic, but the brass scales are mostly smooth except for the etched company name, which doesn’t make for a very good grip. The blade is what I would call a modified drop point. It’s obviously made of Chinese steel at the price point of 7 about dollars. But the blade is well done. The hollow grind is machined perfectly, and the edge is hair-popping sharp.This has one of the best factory edges I’ve seen in some time. There’s a little bit of token jimping on the spine of the blade. It’s actually functional, but just barely. The carabine style wire clip gets its spring tension from the way it’s cut, and fits into a couple little holes on the blade. 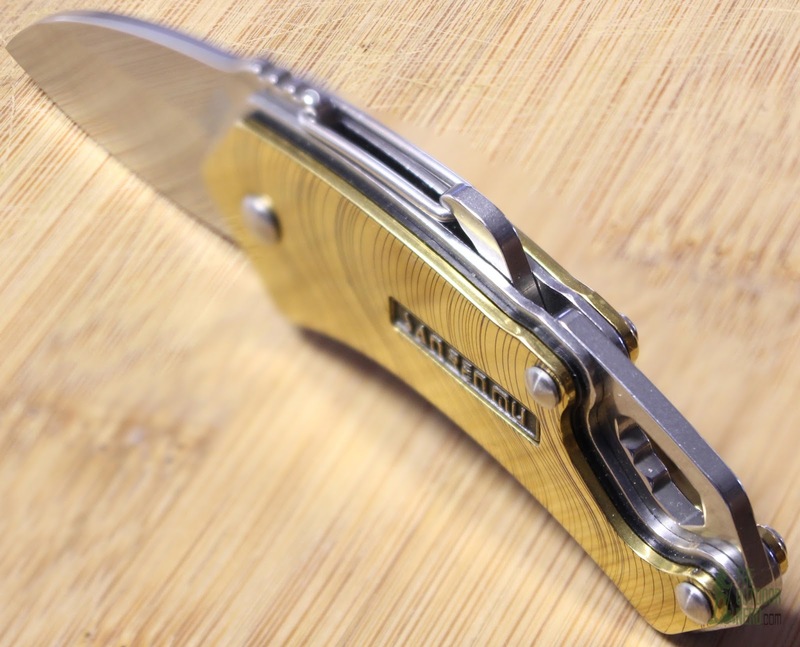 Like most budget pocket knives, the clip on this one is the Achilles’ heel. It’s not terrible if you don’t put too much force on it the wrong way. If you do, well, mine went flying and I had to find it. I was able to put it back on, and it seems to work OK. While I think the knife itself is probably fine for hard use, I would definitely not use the clip in any hard use scenario. But for day-to-day and EDC use, I think the clip is good enough to where you shouldn’t have to worry about it falling off your belt loop or wherever you have it clipped. This knife has no real locking mechanism, though there is kind of snaps into a detent, which at least holds it open. This knife has a hole for a lanyard which is a curious design choice, seeing that if you were to carry it with a lanyard, you would risk the clip hooking everything in sight, which is the clip’s purpose what this style of clips is so good at. I guess you could use both, or have the lanyard just for decoration. There is some jimping inside the lanyard space, which is also curious, but makes sense for keeping the lanyard from flopping around. At any rate, it’s an opportunity to shed a little weight. Below it almost looks one of those hex wrench tools, but I don’t think it’s machined well enough for that. Like they said “aww screw it.” Or like I said, maybe it’s to hold the lanyard tight. Also notice the screws look suspect, especially the one on the top. I carry every knife I review, even if I know for example that I won’t ever carry a slip-joint knife, and if I do, it’ll usually be a Victorinox Tinker or Executive or something like that. Having said that, I think it looks sharp clipped to a belt loop on blue jeans. And the blade geometry is very good for an EDC type of knife. I usually EDC small, and this is a very good size and weight for being clipped to a belt loop. At about 2 1/2 ounces, it’s a little heavy to ride at the bottom of my pocket. If I were living in the UK, then I would absolutely consider this model for EDC, even with the cutesie factor. I’m no fan of the cheap carabiner clip, and I’m no fan of slip joint pocket knives since I don’t live in the UK, and I can pretty much carry whatever I want in Oregon. 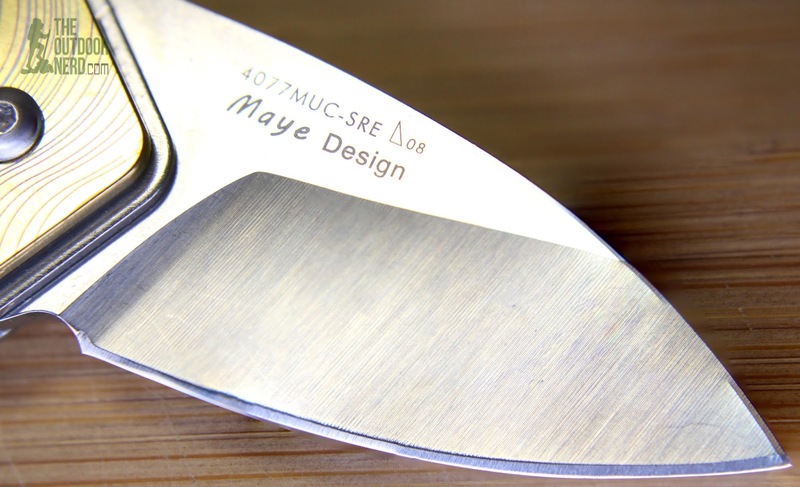 But this knife has some of the best machining I’ve seen in a long time. I started with this knife skeptical that it was a real Sanrenmu, but it really doesn’t matter at this level of quality and this price point. 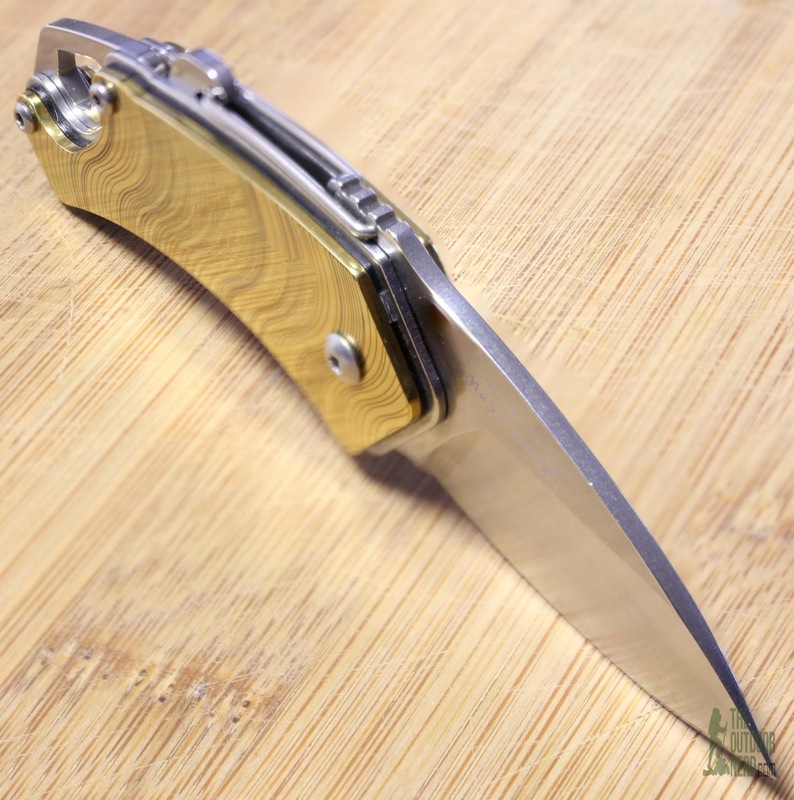 This is a budget knife clearly made by people who know how to make good budget knives.